This post was created in partnership with Livingbox. As my friend Eddie and I sat down for my first ever experience of Chinese hot pot last September, he told me how one of his Chinese housemates had made hot pot at home, setting a big pot of gently bubbling, aromatic soup in the middle of the table, heading to the local Asian supermarket for a selection of veggies, seafood and impossibly thin pieces of meat for everyone to dip in the broth. 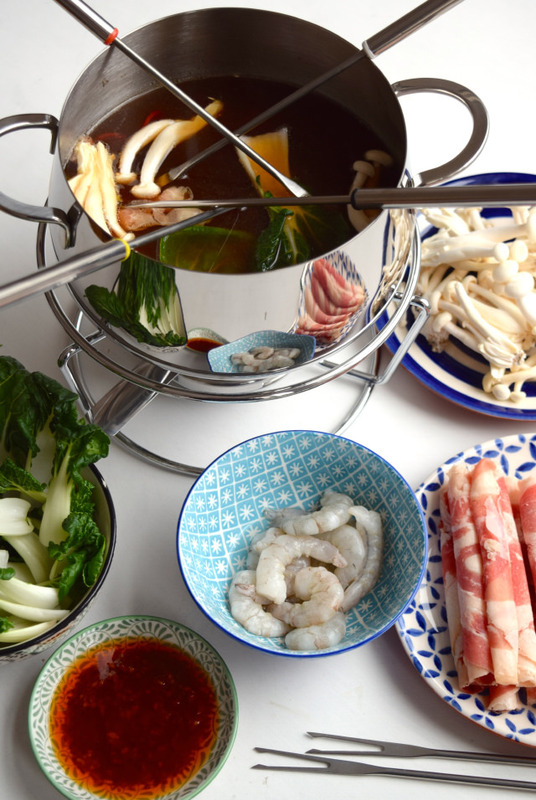 We had a highly enjoyable and satisfying meal, so it was obvious to me that when Chinese New Year came around (it’s on Friday, fyi) again I’d try my hand at making my own hot pot at home. I knew it would be easy to make a satisfying, aromatic broth, and to gather a few items both from Chinatown and my local Waitrose to cook in it. My main conundrum was how to keep the broth hot enough to cook raw meat and seafood at the table. I thought about doing it in the slow cooker, which is totally an option (set on high) if you can eat somewhere near a plug outlet. 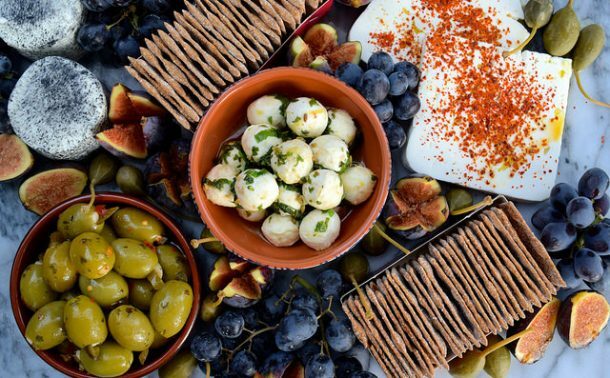 Some people place a saucepan over a portable campfire burner, but when the team at Livingbox got in touch to see if I wanted to try one of their fondue sets, the idea came to me. 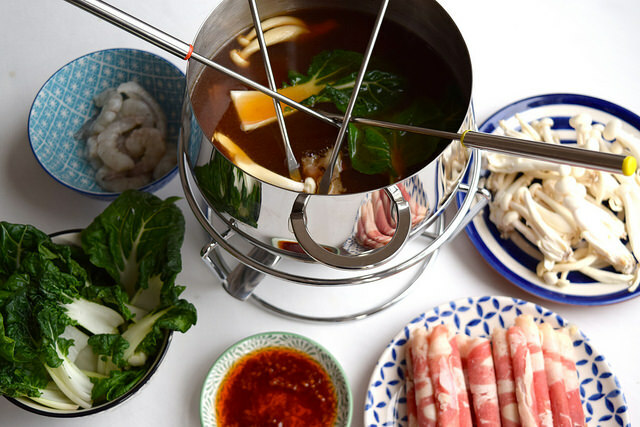 How many of you have a dusty fondue in a box somewhere you’ve only used once that would be absolutely perfect for hot pot? As we ring in the Year of the Dog, Chinese New Year, like our regular New Year is about celebrating new beginnings and wishing for luck in the year ahead. In the spirit of all things new, Livingbox are offering you guys 10% off site wide with the code LIVINGBOX10 until April 30th. Use it to get a fondue set, the all important fondue fuel even if you do already own a fondue (trust me, it is near to impossible to find this stuff on the high street so you need to plan ahead and order it online!) or a set of wire skimmers so you can also cook things like salmon pieces that would otherwise fall apart as they cook (or to fish our pesky mushrooms!) in your hot pot. Alternatively, they have some great kitchen storage ideas, heavily discounted pots and pans, and some sweet novelty mugs. You can shop independent online, and not just on the high street you know! The aromatic broth is really easy to make if you have a good homemade chicken stock to hand (you can find my recipe here and stash it in the freezer for later, or buy it from the fridge section in the supermarket, the best you can get your hands on! ), or you can make a simple miso soup from paste mix, and you can get hot pot soup pastes in Chinatown. 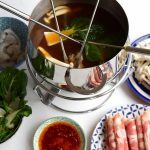 While that is simmering you can make an easy dipping sauce (unless you’re making hot pot for two, perhaps a Valentines idea?) you’ll need to replicate the below mixture in a small dish for each person. Here I’ve got Asian mushrooms and baby bak choi for the veggie contingent (both from Chinatown as they’re much cheaper there, but also available in the supermarket), raw king prawns (from the freezer section defrosted, again, much cheaper) and rolls of thinly shaved beef, designed for hot pot you should be able to find in the freezer section of any good supermarket. However, you don’t have to stop there. 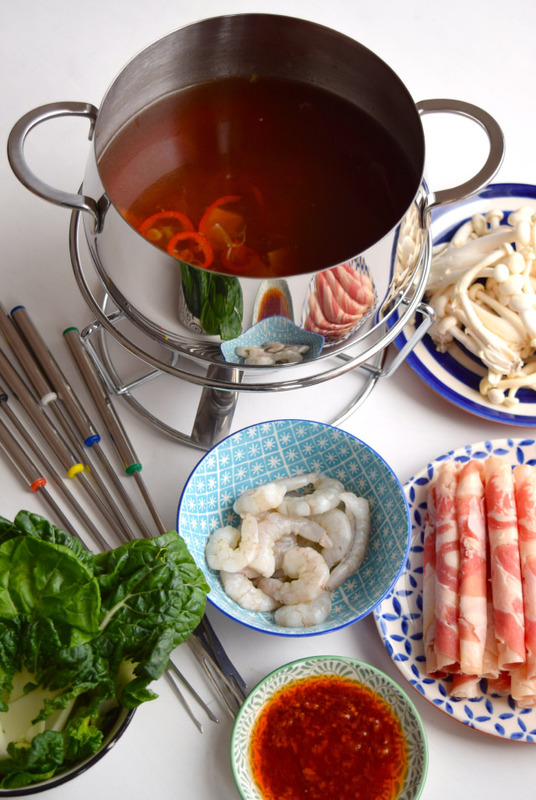 Pretty much if it would taste good in a bowl of Asian broth as a soup, and it is cut so it is thin and will cook quickly, you can put it in hot pot. I’d move away from chicken and pork at home for safety, but thinly cooked steak, pieces of fresh squid (things like squid and prawns are great because you can see when they’re cooked), carrot ribbons, bits of lotus root, slices of corn on the cob. Even noodles will work (add them at the end to polish off the broth!) 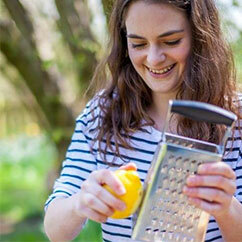 Go to town, pick a bit of what you fancy, and remember this is also great to clear the fridge! Once you’ve got all the little dishes of dipping items ready, a dipping sauce for each person, all you have to do is set your both in the fondue so it is just simmering, and distribute the fondue forks! 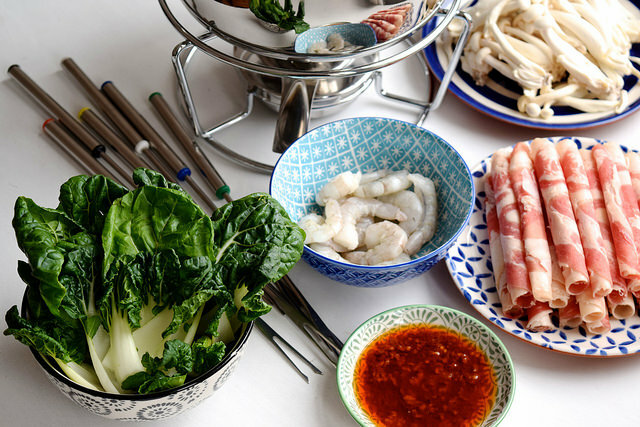 Be generous with the add ins when you’re deciding how much food to lay out per person (people will eat way more hot pot than you think they will!) and this can serve from 2 to about 6 people. 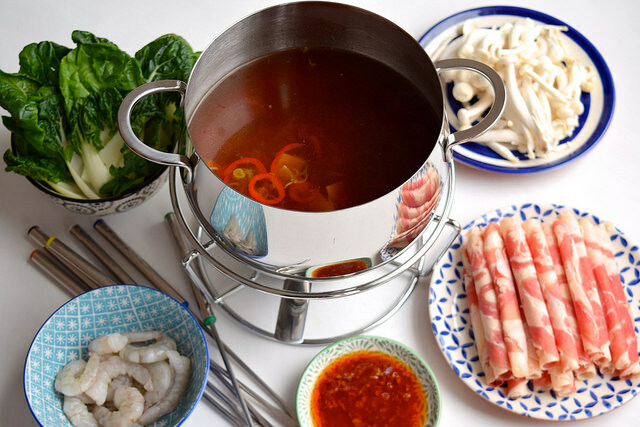 How to make a great Chinese-style hot pot to share at home in a fondue. 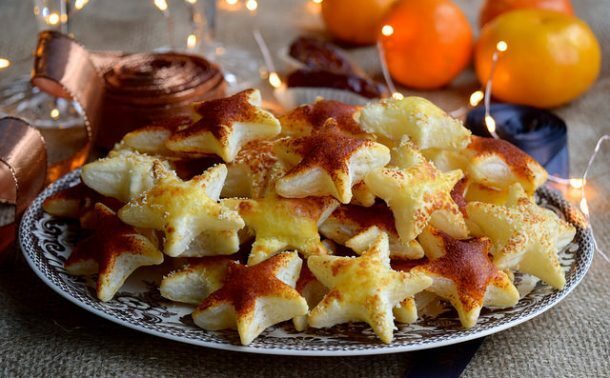 Great if you’re entertaining on Chinese New Year! Set the stock to simmer, and add the lemongrass, ginger, spring onions and chilli and and when you’ve finished preparing them. 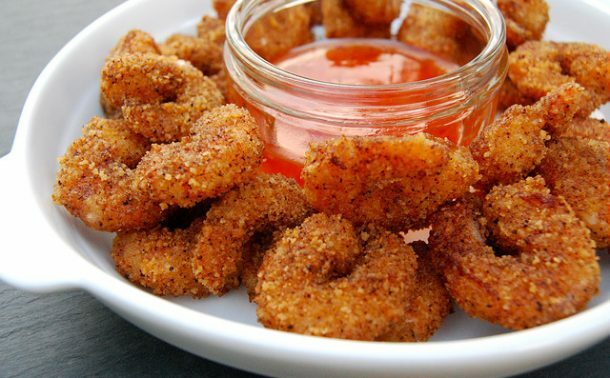 Leave the broth simmering as you prepare the rest of your vegetables, meat and seafood and you’ve made each individual dipping sauce by combining a crushed garlic clove, the toasted sesame oil, sriracha and a pinch of salt. Season the broth to taste with soy sauce and or salt (how much you use will really depend on the stock you started with) and transfer to the fondue to serve.